The council’s Children’s Services Department has submitted an amended application for a new primary school on the former Putney Hospital site. The amended application includes an increase in the number of rooftop solar panels and an increase in cycle parking provision to 60 for the school and 28 for the associated residential development. There are also new addenda to the Transport Assessment and Energy and Sustainability Strategy, revised Environmental Noise Report, Design and Access Statement and Planning Statement, and a new planning application form has been submitted. The size of the 420 pupil primary school and the number of 24 proposed flats remains unchanged. Putney Hospital , which is situated on the eastern edge of Putney Common, closed services to patients in 1998. It has remained vacant ever since. If the plans are approved, the original timetable for the opening of the school will not change and children would begin to be admitted in September 2015. 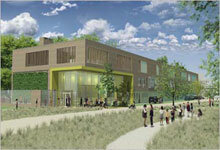 If the new school gets planning permission, it will be run as an academy. This would make it part of the state sector but give it greater freedoms to manage its own affairs and work in partnership with other schools, academies and education establishments. A new consultation period will shortly be launched, to coincide with the new planning application, which will be considered in the normal way. The consultation will include new site and press notices and letters sent to nearby residents and people who previously commented on the proposals. However, all those residents who have previously taken part in the consultation will have their comments carried forward so that they are fully considered in relation to the new application. The application number will continue as 2012/0758, so there is no need for comments to be resubmitted unless you wish to make new or additional points. The consultation period will run until the application is determined by the council's Planning Applications Committee, the date of which is likely to be September 19 at the earliest. In order for any comments received to be included within the report on the application, new comments need to be received by September 7. To comment online find the application using application number 2012/0758. Click on 'View related documents' then follow the 'comment on application' link on the top of the right-hand side.